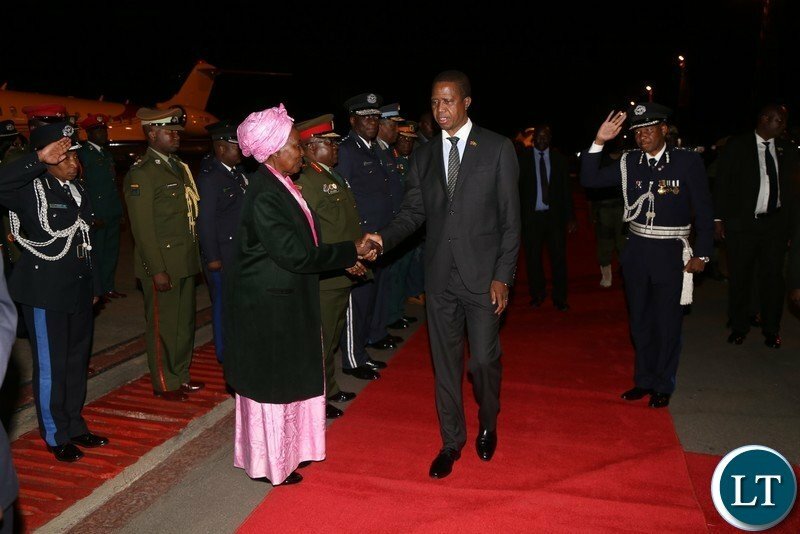 President Lungu has arrived back home after concluding his working visit to China where he attended the China Africa forum and visited a number of Chinese firms. 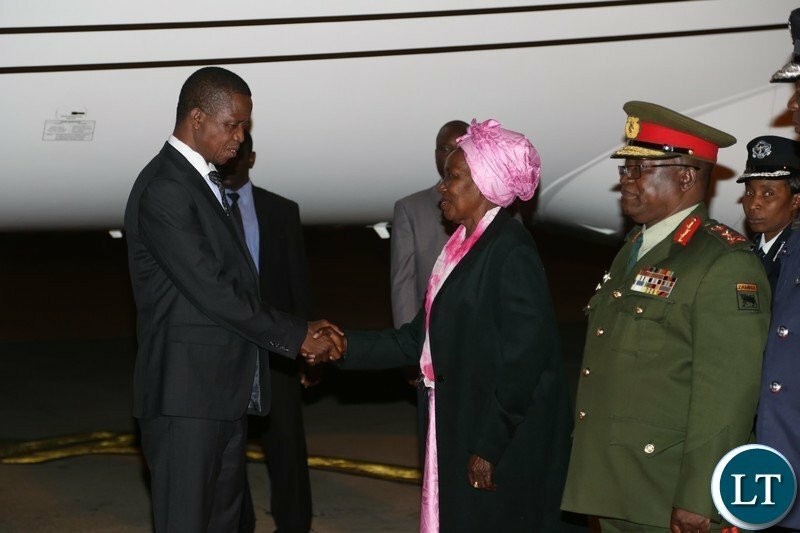 President was met on arrival by the Vice President Ms Inonge Wina and other Government officials. On His last day the president toured China’s largest integrated copper producer, Jiangxi Copper Corporation Limited (JCC), based in the Chinese province of Jiangxi. Established in 1976, JCC is a state owned enterprise and the only Fortune Global 500 companies in Jiangxi province. And in 2017, JCC produced 1.3749 million tons of copper cathode, achieved a turnover of 225.2 billion Yuan with EBIT at 7.734 billion Yuan. Its principal activities include copper mining, milling, smelting and refining to produce copper cathode and other related products, including sulphuric acid. Jiangxi Copper Corporation Limited like other Chinese enterprises and companies have expressed interest in investing in Zambia following the historical twinning of Jiangxi and Muchinga provinces. Which one sounds better Chinambia or Zambihina, this is in preparation for country name change when the Chinese completely take over our country thanks to clueless Edgar! There is no difference in Lazy’s absence.. When is Lungu arriving back to Chibolya and Kalingalinga to see the poverty and hopelessness he presides over? BUT ZNBC AT 07:00 HRS NEWS SAOD THE PRESIDENT WILL ARRIVE LATER TODAY???? What time did he arrive? Did Bowman make it to KKIA that early? Anyway it is good that they did not have to disrupt us with traffic jams this morning. This is as it should be. In fact I now propose that the President travels only in the early hours or late at night when our traffic is minimal. Oh sorry, and Welcome back home Your Excellency!! Bo Inonge looked after us very well and kept us safe from Hacks. Comment:you are most welcome Mr president! hope u have brought us Chinese food coz some of us are starving heavily! That looks like a night dress the veep is putting on??……. I AM STILL DISAPPOINTED WITH ZNBC. DO THEY DO SERIOUS INVESTIGATIONS AND FIND OUT WHAT IS HAPPENING AROUND THEM? YOUR OWN HEAD OF STATE HAS ARRIVED. AND YET YOU ARE REPORTING TO US THAT HE IS YET TO ARRIVE. ?????? SOMEONE MUST BE FIRED AT ZNBC FOR GIVING US WRONG STORIES. Amos Chanda said that if IMF delays approving the $1.3 Billion Loan they will get a Cash Bailout from China. Was Lungu given a Cash Bailout by China amounting to $1.3 Billion? He has come back after amassing more debt. Just accept that this country has been auctioned to the Chinese. This is so wrong. Zambia has not been auctioned. For that to happen, there would have been some form of bids from other countries. Zambia has been given away to China like a child bride to an abusive, middle aged man. Well come back your excellency but handle Chinese investors with caution, not everyone of them means well. On the other hand, can we stop selling land to them but instead partner with them? As much as they travel, they need to invest in a bigger and new Presidential plane. This habit of Chartering aircrafts is too expensive for a broke country like Zambia. Welcome back your Excellence. I want to report that generally all is well except for the gossip that you have borrowed to unacceptable levels on behalf of the Nation. Please put us in the clear. I do not think you can get to those said levels while you enjoy advice from the best there is in terms of economic advice both from within and outside your Government. Strongman His Excellence President Edgar Chagwa Lungu . This one mukakose! !